I have already ranted about how lemony I like my lemon baked goods — very lemony. Today, I’m sharing with you another super-zesty recipe. This time, it’s for light, breakfasty lemon scones. I’ve lightened up this traditionally buttery treat by using olive oil as the fat to make it a tad healthier (OK — to be honest, it’s really because I didn’t have anything else in the house when my baking mood struck…). The olive oil flavour does come out in the scones, so feel free to substitute another oil of your choosing, or stick to butter (but double the quantity in the recipe if you do). The substitution makes the scones dairy-free, so share it with your friends who can’t handle lactose! 1. Preheat your oven to 375º. Make sure your oven rack is placed in the top 1/3 of your oven. 2. In a bowl, combine the flour, sugar, lemon zest, poppy seeds, salt, and baking powder. Stir with a fork until ingredients are distributed evenly. 3. Add the olive oil. Using a spatula or your clean hands, mix the oil into the dough until coarse crumbs begin to form. 4. In a bowl, combine the egg and lemon juice. Whisk until combined. Add the juice mix to the flour and stir or lightly knead until just combined. The dough should be somewhat sticky, but still crumbly enough to fall apart if you knead it. Do not overwork your dough! 5. Add one tbsp of water to the dough at a time, mixing into the dough before adding the next. You want your dough to hold together without being too sticky, so the water will help it stay together. 6. Divide the batter into 10 even balls and place on a nonstick or greased baking sheet. Bake until golden brown, approximately 20 to 30 minutes. Transfer the scones off the baking sheet immediately and allow them to cool slightly before enjoying one with a nice hot cup of cream of earl grey. 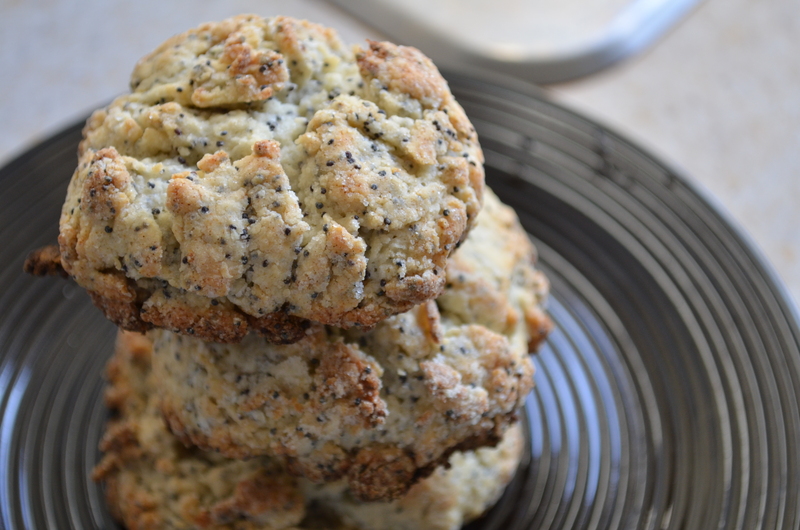 This entry was posted in Breakfast and Brunch, Dairy Free, Desserts and Baked Goods, Vegetarian and tagged baking, breakfast, lemon, olive oil, poppy seeds, scones, vegetarian, zesty by laratboulos. Bookmark the permalink. I like my baked goods very lemony and zesty, too! I have never tried making scones with olive oil but one of my all-time favorites is olive oil cake (say, with a touch of rosemary). Thanks for commenting! That cake sounds soooooo delicious… I’ll have to try it. I am getting ready to open a bed and breakfast on a very historic property in Virginia. (it’s where James Madison was born) One of the events we are going to offer is an Afternoon Tea. So I am so glad I came across your blog! Thanks for the great post!